In this article we will see casting process type- Centrifugal Casting types, Working principle, Centrifugal Casting advantages and Disadvantages . The casting process involves pouring of liquid metal in to a mold cavity and allowing it to solidify to obtain the final casting. The flow of molten metal into the mold cavity depends on several factors like minimum section thickness of the part, presence of corners, non-uniform cross-section of the cast, and so on. The casting processes can be broadly classified into expendable mold casting and permanent mold casting processes. In centrifugal casting process, the molten metal poured at the center of a rotating mold or die. Because of the centrifugal force, the lighter impurities are crowded towards the center of the case. 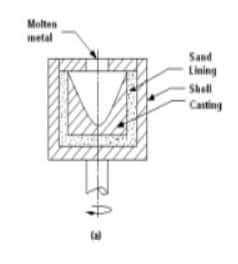 For producing a hollow part, the axis of rotation is placed at the center of the desired casting. The speed of rotation is maintained high so as to produce a centripetal acceleration of the order of 60 g to 75 g. The centrifuge action segregates the less dense nonmetallic inclusions near to the center of rotation that can be removed by machining a thin layer. No cores are therefore required in casting of hollow parts although solid parts can also be cast by this process. The centrifugal casting is very suitable for axisymmetric parts. Very high strength of the casting can be obtained. Since the molten metal is fed by the centrifugal action, the need for complex metal feeding system is eliminated. Both horizontal and vertical centrifugal castings are widely used in the industry.